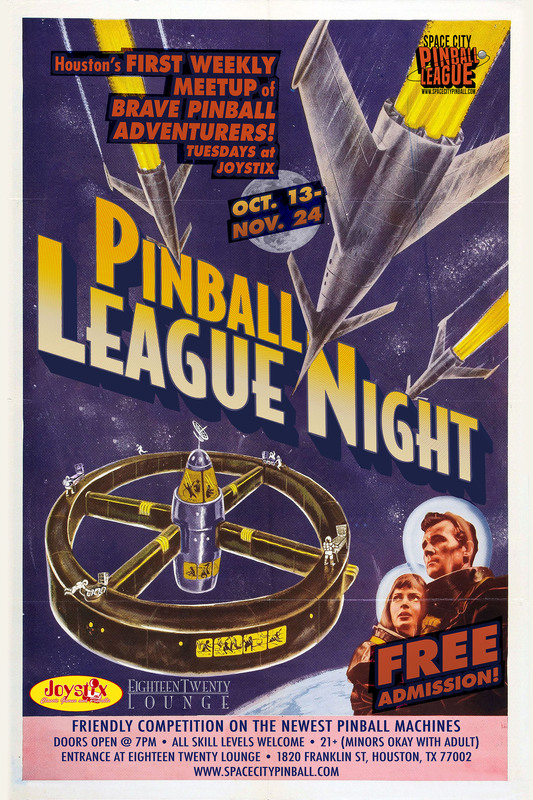 The Space City Pinball League will start its inaugural season at Joystix/Eighteen Twenty Lounge on October 13 at 7:00 PM. The league will meet every Tuesday (excluding Oct 27) for 5 weeks, followed by a finals. If you’re looking for something unique to do in Houston, then come on out, have a few drinks, and play some pinball! Eighteen Twenty Lounge will provide drink specials and prizes throughout the season. Joystix will provide a selection of pinball machines each week, ranging from the newest Sterns to older classics. All skill levels are encouraged to attend, from total newbie to seasoned pro. If you’re interested but not sure how to play, myself and other players would love to teach you the rules and give you tips for playing. Once you get past the initial learning curve, you will discover that pinball is a ton of fun. New players are welcome to join on any regular season night. Flyer courtesy of Stephen Silver.